These veggies smell great as they are roasting, and they were fabulous alongside a roast chicken. So easy, and a delicious comfort food on a cold winter night. Feel free to add more or less of any of the vegetables, or omit some altogether. Preheat the oven to 400 F. If you’ve just roasted a chicken, as I did, put the bird aside with a cover on to rest just before you put the vegetables in the oven. Scrub, then chop the vegetables into pieces that are about 4cm. The sweet potato can be a little bigger, as it cooks faster. Put them all on a baking sheet and drizzle with some olive oil. 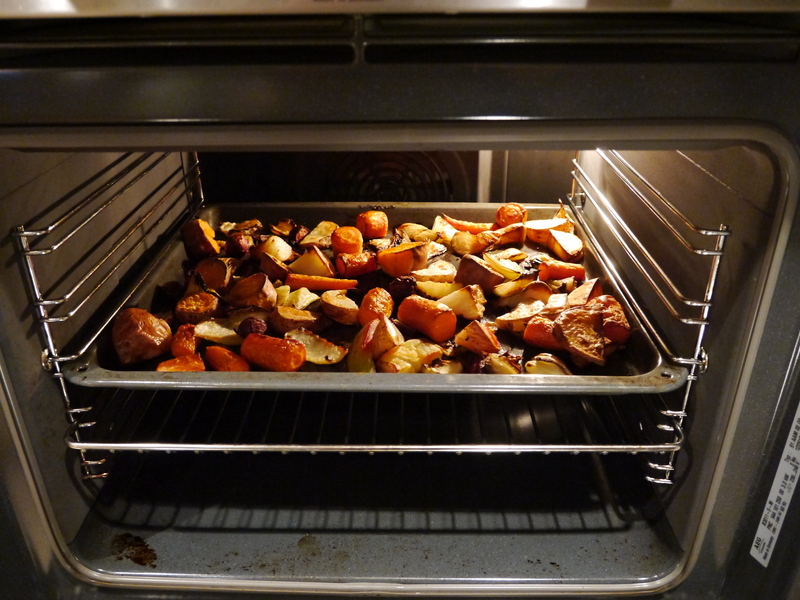 Roast for about 10 minutes, then take them out of the oven and toss them around a bit. Return to the oven and let them cook for another 10 minutes, or until they have browned nicely. Salt and pepper the vegetables, then serve immediately. Yum I cannot get enough roasted vegetables. Carrots, sweet potatoes and parsnips are my fav. I’ll have to add parsnips next time I make this. Thanks for the idea!